Meet McKenzie! McKenzie is a fire spinning fermenting wizard that can ski. Or so she tells us. 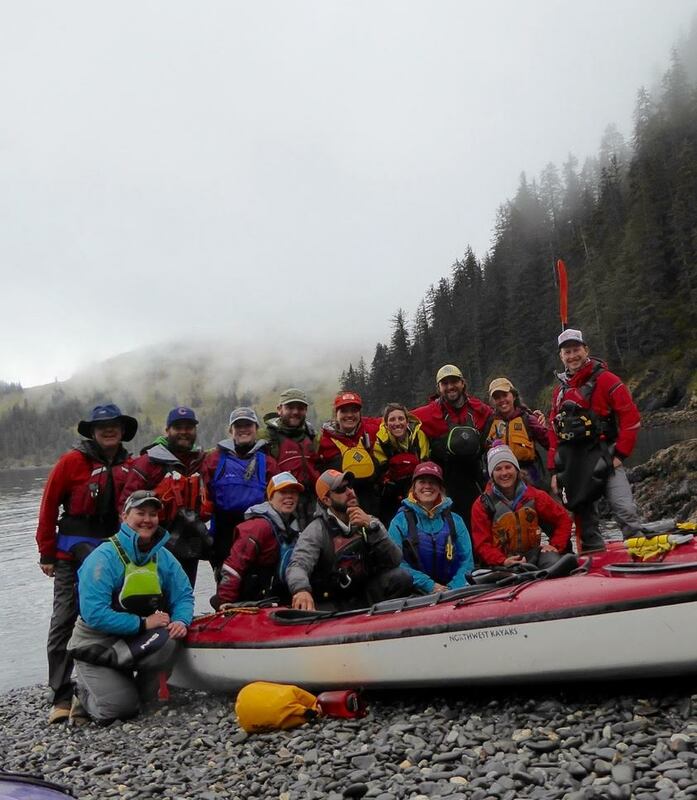 While most of our guides come from all over the lower 48 states looking for adventure, McKenzie is the rare breed that is actually from Alaska! Growing up in Anchorage she was privileged to have spent many years in this great state and decided to move to Seward for the summer and guide with Sunny Cove. McKenzie is a first year guide with tons of Alaskan knowledge and if you are into plants and flowers, she's the guide for you! We were excited to bring McKenzie on board and please continue reading below to learn more about this wonderful new addition to Sunny Cove! Favorite Sport: Besides sea kayaking?! Backcountry skiing!!! Number one item of bucket list: I want to take an underwater photography/diving course. Best Life Experience: I had a stint at a tiki bar on the Caribbean coast of Colombia. Every night I got to watch the sunset over the bay and during the day I got to go swimming, kayaking, fishing, and ate copious amounts of mangoes and rum. It was really amazing there and I am planning a return trip. Best Alaskan Experience: As a child my mom used to take me out in the winter so that we could look for northern lights. I would get all bundled up and curl up in my sleeping bag amidst the snow watching the sky for that magical flickering. I always fell asleep before I saw the lights but getting to stay up late watching the sky with my mom is one of my favorite memories. Why I love to guide: I love to show people my home and the amazing wilderness that still exists in the world. Plus I enjoy the dynamic challenge that each day can bring! Random fact: I love teaching people about edible foods, foraging, and fermentation. Personal Statement: Instead of a personal statement, let me tell you my perfect date. Let's go on an adventure, whether that be sea kayaking, skiing, or whatever else we can come up with that is active and that doesn't cost a lot of money. After that let's make food and celebrate being alive. Badda Bing Badda Boom. Party on Wayne. Kelly S. is one of our newest additions to the Sunny Cove staff. Kelly hails from Miami Beach, Florida and spent this past winter guiding trips in the Florida Keys. That's about as far away as you can get in the U.S. from here, but we are glad she made the trek up! Kelly isn't new to the Alaskan experience as she attended college here majoring in Outdoor Studies. She has a specialty and knowledge base in trail work and non-native plants and lives her life by LNT (Leave No Trace) principles. Kelly S. joins Kelly M. as our second Kelly on staff. Only time will tell which Kelly we decide is the best Kelly, but for now we think you are in good hands with either one. You can find Kelly driving around Seward in a full size van she lives out of that sometimes works. If you see her stranded on the side of the road, please give her a ride so she is not late for work. Continue reading below to learn more about Kelly! Kelly's initials are K.S. It really stands for Kayak Selfie. Number one item of bucket list: Explore more of the world! Best Life Experience: Taking a risk and going to college across the country. I grew up in Florida and decided to go to Alaska for college. Best Alaskan Experience: I backpacked the Talkeetna Mountain Range for 21 days. The experience in general was hard, but life changing. Why I love to guide: I love getting people excited about the environment. Random fact: I love riddles. I know a ton of them! Personal Statement: I am excited about guiding and sharing all the info I know. I am ready to have some fun! JD is back and better than ever for year two as a Sunny Cove guide and we are thrilled to have him around again. If you remember from last year, JD is from the state of Iowa which we were never able to find on a map so moving on to other things...Over the winter, JD finished up his Degree in Outdoor Recreation at the University of Northern Iowa where he also worked as a trip leader taking students on backpacking, rock climbing, and canoe trips. He also gained some experience ice climbing and helped build a cross country ski trail for the university. JD was best known last summer for his discovery and love of the movie Frozen. He could be found literally every day singing Do You Want To Build A Snowman at the top of lungs. Our favorite story of JD is that roughly the first 20 times he watched Frozen, he only watched the first half with his favorite songs so that he never knew Prince Hans was the villain until we forced him to watch the entire movie. He was devastated. The crew this year has banned JD from watching Frozen so we are all waiting with anticipation to see what new Disney musical songs he will start singing. We are glad to have JD back on the team and continue reading below to learn a little bit more about one of our experienced guides. Best Life Experience: Meeting fellow Cubs fan and sea kayak guide Bobby! Personal Statement: Go Cubs Go. Thank you. Standing by on 1-0! How Fun Are Our Guides? Having fun is a big part of what we do here at Sunny Cove!